Remington Upland Premier Series Field Shirt. Photo by Chuck Hawks. 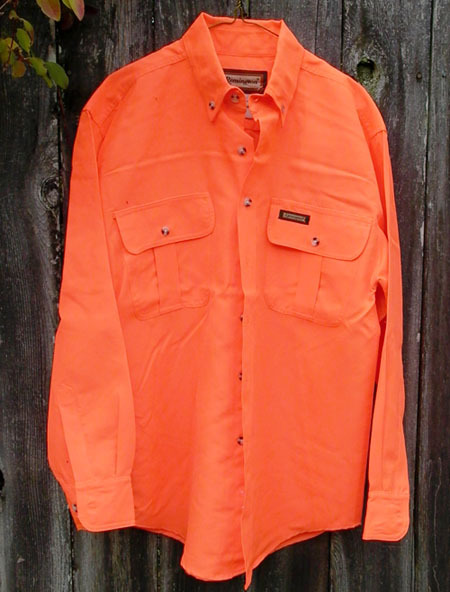 Like much of the Remington clothing line, this blaze orange, long sleeved field shirt (style # 17114BZ) was sourced from the Brinkman Corp. of Tulsa Oklahoma and made in the Philippines. It is machine washable shirt (cold wash, dry on low heat) that, were it some other color, you could wear on a date. The Upland field shirt is made from 100% polyester material. All seams are double stitched and the two front pockets are oversized and covered by button down flaps. The cuffs sport double buttons and the front closure is also by means of buttons. All of these buttons are camo pattern, which given the extreme visibility of the shirt material is kind of amusing. It is rather a good looking shirt that lets you go hunting in style. It also offers a useful level of protection against biting insects, sunburn, and (given its high visibility color) other hunters. I much prefer a long sleeved shirt in the field for all of those reasons. The large front pockets are useful for a variety of small items, from a pocket camera to a compass or a pack of smokes and a lighter. And the flap means that whatever you put there will stay there. I got my Remington Upland Field Shirt during an end of season sale at my local Bi-Mart discount department store for only $12.97. The regular Bi-Mart price is $19.87, and at that price I'd still consider this durable shirt a good buy. Definitely recommended!